Tenneco has launched a new print and digital advertising campaign highlighting several important quality, performance and value benefits that the company says come from using the trusted Monroe brand. 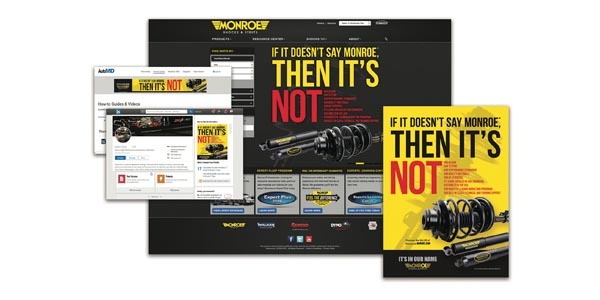 The new “If It Doesn’t Say Monroe” campaign reminds parts and service professionals that while many ride control products might look alike, their brand, manufacturer and point of origin can point to hidden differences, which could affect performance, durability and customer satisfaction. Each of the new ads reminds industry professionals and their customers that any shock absorber, strut or other ride control product offered under the Monroe brand carries several important advantages: Tenneco’s product designs, performance standards, and on-vehicle fit and ride tests conducted in Monroe, Michigan; use of only high-quality materials; engineering insight gained through Tenneco’s extensive global OE business; and product assembly completed at the company’s world-class manufacturing facility in Paragould, Arkansas. Beyond benefits that directly enhance consumer satisfaction, the campaign also underscores business advantages gained through the Monroe brand’s marketing programs and best-in-class technical and training support – benefits available to service providers before, during and after each customer transaction, according to Tenneco. 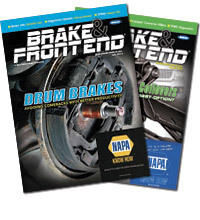 “There is often a huge gap between replacement parts offered by premier brands and those that might simply look like quality parts,” said John Perrin, executive director, product management, North America Aftermarket, Tenneco. “Because the success of every parts and service business is based on providing the quality, convenience and value consumers demand, choosing a lower quality part could have significant consequences, including a vehicle coming back into the bay for repeat service. The new Monroe ads will run in a broad range of automotive service industry publications and reach thousands of additional industry professionals through a variety of digital placements, feature articles, social media activities and eNewsletters. “If It Doesn’t Say Monroe” also is prominently featured on monroe.com.